There’s nothing quite like a family vacation to the Happiest Place on Earth. Crazy rides, great shows and a hefty dose of fun make Disneyland a part of almost every family’s bucket list. But when you start adding up the price tag of that magical vacation, between airfare or driving expenses, food and drink, park passes in excess of $100 per person, and of course the hotel, it can make everyone’s wallet a little less happy. While many parents might want to give their children the “full experience” of staying inside the park at one of Disney’s signature hotels, there are actually quite a few nice hotels just outside the gates that are much more affordable. They offer many of the same amenities as the park hotels but without the high price tag, as well as perks like free breakfasts, swimming pools and ample parking. Most are less than a 15-minute walk to the park, and some even have free shuttles to and from the main entrance. 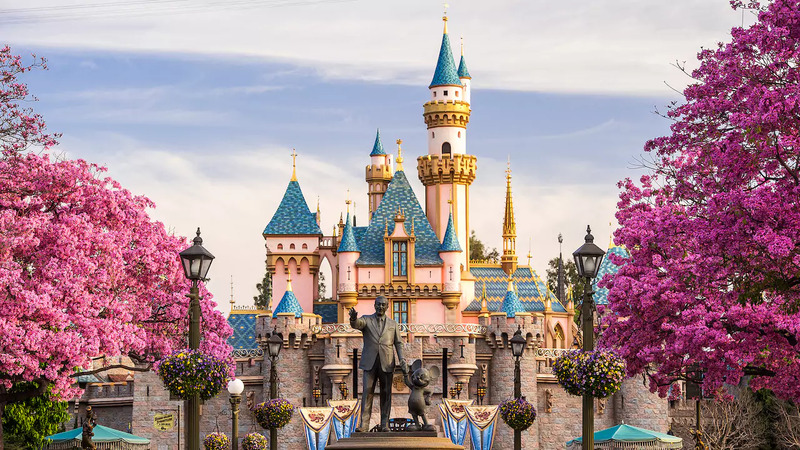 Here are the top five affordable hotels near Disneyland to help you plan the family vacation of your dreams. It’s no surprise that this Howard Johnson is considered a top family hotel. With plenty of amenities and a pirate-themed water park area, it’s almost as fun as the parks themselves! Kids will love Castaway Cove, with its huge pirate ship, water slides and wading pool. Parents will love the free Wi-Fi, free parking and the easy walkability to Disneyland and California Adventure. Rooms are spacious and include standard and premium sizes, as well as kids suites with bunk beds. 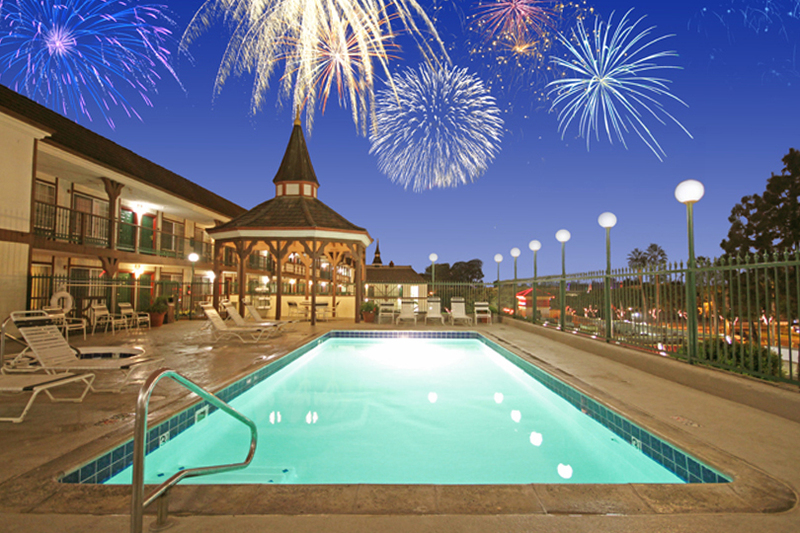 Most of the rooms include balconies, where you’ll have great views of the parks and can catch the evening fireworks shows. Sitting on 13 acres of manicured grounds that include a koi pond, outdoor pool and Jacuzzi, the Anaheim Majestic is not only perfect for families, it’s a relaxing oasis for anyone staying near the park. There is a bar and restaurant onsite, as well as a more casual deli service for quick snacks. The hotel is an authorized Disney seller, so you can purchase your tickets there prior to heading out. They also offer a free shuttle, which runs to and from the park every 30 minutes. 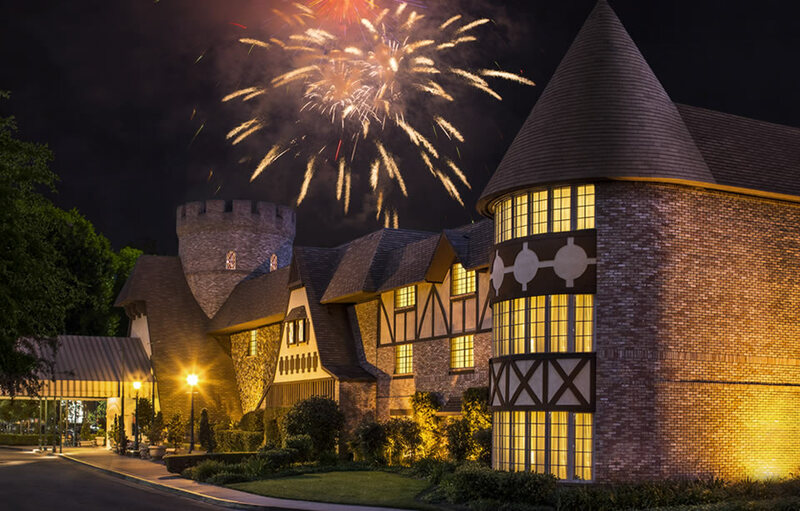 The Camelot Inn’s charming décor and classic European architecture probably comes about as close as you can get to staying in Sleeping Beauty’s castle itself on a budget. One of Disneyland’s designated “Good Neighbor” hotels, the staff here goes out of their way to make sure each guest has a memorable experience. Amenities include free Wi-Fi, a pool and sun deck with Jacuzzi, laundry facilities and a gift shop. Park tickets can be purchased onsite, and it’s just a quick walk across the street to the park itself. A longtime favorite of Disneyland fans, the Hilton Anaheim is located one mile from the park and boasts a large pool with a children’s play area and water slide, two Jacuzzis, onsite parking, a gift shop and a car rental desk. The kids will enjoy the Disney décor around the property, and there are multiple restaurants onsite as well as plenty of other dining options in the neighborhood. The hotel staff can also arrange shuttle service to and from the parks. Located just two blocks from Disneyland, the Kings Inn offers a family-friendly experience within walking distance to the parks. With free parking, free Wi-Fi, complimentary breakfast and a decent-sized pool and Jacuzzi, this hotel has the amenities you need in addition to its reasonable rates. It even has a guest laundry room, which is essential for any traveling family. Kings Inn has several room types to choose from, and each comes with air-conditioning, coffeemakers and flat screen televisions. It’s close enough to take a midday break from the parks and rest at the hotel before returning for the evening shows.